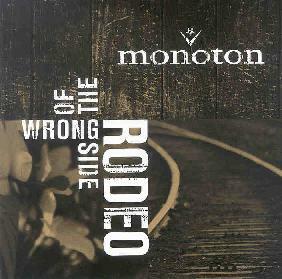 Monoton - "Wrong Side Of The Rodeo"
Monoton are a band from Copenhagen, Denmark and they play angry ballads in a distorted background. The music is not for the faint of heart. The band take heavy distorted guitar riffs and mix this with sounds created with a turntable and some angry vocals. The music lands somewhere in between heavy rock and industrial music but no electronica here. I saw the band twice back in 2000 and have their first CDEP called Somebody Down There Digs Me. All of the songs from the EP were re-recorded for this CD except one. The CD begins with "Electric Mudslide", a slow moving heavy droning song that is thick like mud. Damn cool. "20 Miles" is a screaming angry foot stomping raw distorted rocker. "I Get Around" and "Rebotko" slows things down and a heavy bass line is laid down from which the vocals and guitar are layered upon. The band does not want to give you much of a break before the heavily distorted "VIVA" kicks you in the head. Phew... "Take Me Home" is one of the bands stand out tracks and is music for some kind of psychedelic nightmare. Heavy and brutal. This could be a bit like TOOL but it is very distorted and heavier. "Saddle" is again a very heavy distorted piece of mood music. "Waltzin Dust" from the first EP closes the CD. If you like your music, heavy, angry, moody, then you should get a hold of this excellent CD. For more information you can visit the Monoton web site at: http://www.monoton.dk. Contact via snail mail c/o Morton Havn; Niels Ebbesensvej 18A; DK-1911 Frederiksberg C; Denmark.